XLS Medical Carb Blocker is an oral medication used along with a balanced diet and exercise to aid weight loss. It operates by preventing the absorption of excess carbohydrates during the digestive process. This prevents the formation of new fat deposits allowing older deposits to be eliminated through exercise. Through this process, obese patients may reduce the chances of heart disease or other cardiac conditions. Your doctor may prescribe this medication to be used along with others or for the treatment of other unlisted conditions, as well. 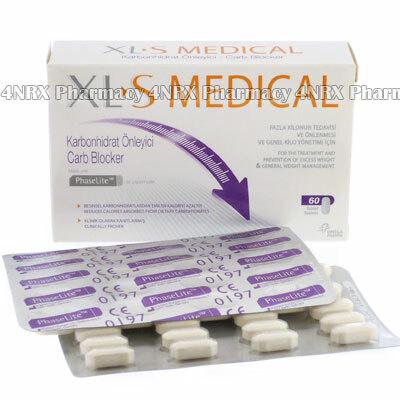 XLS Medical Carb Blocker should be used according to your doctor`s instructions to get the best results. The normal dosage is two tablets taken three times each day just before meals to allow it to begin working before digestion begins. These should be swallowed whole and unaltered along with a large glass of water. Avoid splitting or crushing the tablets before using them as this may alter the effectiveness of their contents. Ask your doctor any questions you have about the medication before beginning use to ensure the correct administration. XLS Medical Carb Blocker will not cause side effects in most patients when used correctly. Stop using the medication and contact your doctor as soon as possible if any serious or worrying side effects occur including faintness, severe diarrhoea, vomiting, or signs of an allergic reaction such as hives, rashes, swelling, or difficulty breathing. These conditions may require reduced dosages, reduced application frequency, or immediate medical assistance in serious cases to prevent more health problems from occurring. Strictly use XLS Medical Carb Blocker as prescribed and follow all instructions provided by your doctor. Safe, suitable, and optimum dosage can vary and is dependent on the patient`s health and medical history, as well as the condition you are treating. XLS Medical Carb Blocker may not be safe or suitable for all patients. Always ensure your doctor is informed if you are pregnant or breastfeeding, using any other type of medication (including non-prescription medicine, vitamins, and supplements), as well as if you have any allergies, other illnesses, or pre-existing medication conditions.